A proposal by the Hung Kings Cultural Development and Research Centre to build a temple and a tower to worship the Hung Kings on the Spratly Islands has proved controversial. People said that more temples were unnecessary as Vietnam already have a lot of temples and shrines and the money should be instead spent on more urgent projects on the Spratly Islands such as water filters, schools or defence projects. However, many think that while more temples on the mainland would be a waste, it would be good that the constructions are on the islands to mark Vietnam's sovereignty. The islands like the Spratly or Phu Quoc hold special strategic positions in terms of both national defence and socio-economic fronts. While there are small shrines and temples and cultural works on the islands, for a long time, Vietnam do not have any important, symbolic constructions to assert its sovereignty there. A temple of Hung Kings, Vietnam's mythical founders, will lift everyone's spirit, patriotism and awareness to protect the homeland. In addition, it will also become a landmark for visitors to the islands. The proposal, in fact, was formed and carefully planned since late 2015. The previous proposal includes symbolic monuments to honour the Battle of Bach Dang River in 938 with total initial estimated cost of USD15.9m. Concerns about state budget is having difficulty is justified. But it is said that this project's fund will come from private sector and several firms and banks already said that they would make contributions. The Hung Kings Temple would be the most suitable symbolic projects to put on Spratly Islands. On September 18, 1954, Ho Chi Minh said with all soldiers at the Hung Kings in Phu Tho Province, before taking over Hanoi that, "The Hung Kings founded the nation, we must get together to protect it." That's why the project is necessary and holds significant meaning, especially on the Islands. 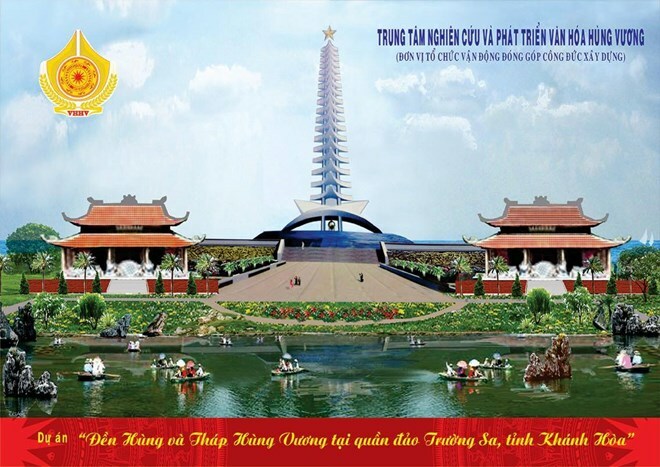 Visitors and locals will remember Hung Kings and Ho Chi Minh's statement whenever they see the temple and will be motivated to continue protecting the country. That said, it should be taken into consideration on how to spend the money wisely to ensure that it will be a quality project with high artistic value.